When I was a child, my dad initiated my strong interest in sports that fills my life even now… and continues to deepen. Being an MSIA minister since 1987, it was natural for me to one day realize that I could bring my ministry to my love of sports… especially the Philadelphia Eagles. So I’d like share with you my ministerial journey with the Philadelphia Eagles these past few years and how it has expanded to the entire National Football League (NFL). What a trip it has been… and it continues. When I consider my “sports” ministry that has emerged, what I observe is that I share my ministry through my joy, loving and Light…moment to moment each day in my life. My ministerial blessing begins with: “A joy in living, a joy of caring, a joy of being who you are…” It ends with: “Let this day and every day begin with joy. And begin to see that spark that is joy in everyone and in everything. And begin seeing it in the mirror when you look upon yourself.” In between are powerful messages like: “…even through your words and your touch, let the ministry of Spirit be who you are,” and “…even your very breath is filled with the Traveler’s presence.” It is these heartfelt elements that are most important for me to express through my football ministry. One of John-Roger’s sayings is with me always as well: that where there is joy, Spirit is present. So I feel blessed that my ministry has a focus of joy in it. And I experience myself living my ministry quite fully each day. I’ve been a Philadelphia Eagles fan since the 1980s and season ticket member since 1990. In the fall of 2013, I was invited — along with other local spiritual leaders — by a local sports radio station to do a blessing for the Eagles, as they hadn’t won a home game in the last 10. “Minister Marianne” was in the WIP booth at Lincoln Financial Field sharing a blessing (filled with LOTS of LIGHT) for the team. Co-hosts Glenn Macnow and Anthony Gargano joined in with cheers of “LIGHT” a bunch of times, too!! They got it!! The blessings continued two days later at a live pre-game radio show at the stadium when I was asked to share with the panel and everyone what we had done on air two days earlier. I also led an E-A-G-L-E-S cheer on air with a large group gathered in front of the broadcast area. By the way, the Eagles went on to win every remaining home game that season in 2013-14 and made the playoffs! After hearing my radio sharing and prayers for the team, a lot of my football tailgate friends congratulated me and one asked me to officiate at his wedding the following November. I have to admit: I was a “closet” minister for a number of years… and “came out” more publicly as a minister during this time. Last November, I was attending a panel discussion at the Eagles training facility (Novacare Center) in Philly and accepted an invitation to be interviewed with NBC Sports Philadelphia as part of their new “Authentic Fan” campaign through which the station would air vignettes of fans talking about their “being a fan” process. The ads started airing on Friday 11/10… and also were shown on the big screens at Lincoln Financial Field during the Eagles games this past season. I was one of several fans featured in the promos. The next day, the TV station invited me to film a segment of a show dedicated to football, especially the Eagles, called “Quick Slants”. Since I had shared in my interview that I record all the games and then watch them AFTER I’ve been at a home game to analyze what happened (amateur analyst), they thought it would be great to have a fan “break down” some film as part of the segment. When I got to the studio on 11/13, I met co-host Barrett Brooks with whom I’d be filming the segment. Much to my surprise, my participation in the show ended up being an almost six minute segment of a 30 minute show!! And their social media guy had pulled up a bunch of photos from my Facebook and Twitter accounts which they showed on screen as Barrett and I talked about them. I joined an “Authentic Fan” in-studio broadcast prior to the Super Bowl on Feb.4. At one point, I shared how I felt the team focus was “for the highest good of all”… and one of the moderators (Danny Pommell) asked the four of us at our broadcast station to hold hands as I continued to share from my “spiritual” perspective about how the team set aside their egos, were self-less, loved one another… and more. Danny jokingly called it a “kumbaya” moment. I then went home and hosted 27 family and friends for the best Super Bowl party ever: Philadelphia Eagles win! We arrived at the Novacare Center during a sleet/snow storm which didn’t affect our joyous spirits and things started heating up and the fun began. We met and took photos with player Malcolm Jenkins (#27 Eagles Safety) and I shared how I supported his off-field focus on reforming the criminal justice system. While having lunch, I met team President Don Smolenski and player Chris Maragos and shared with them that I am a minister and how the Eagles as a team reflected a number of the teachings in my church: highest good, loving, self-less, putting egos aside, etc.). We were then taken on a tour which ended in the auditorium where we took photos with the Lombardi Trophy. As we were taking photos, Dave started talking about how during the season Coach Doug Pederson made a lot of presentations in the auditorium and that he was on his way to make another one. We all cheered and several of us ran up and hugged him when he came into the room. I thanked him profusely for his leadership and coaching which brought the Super Bowl win and trophy to Philly. That’s when I lost it … in the most joyful way possible! I started screaming and repeating over and over “Oh My God”. So I was selected to represent the Eagles and all Season Ticket Members at the NFL 2018 Draft in Dallas, Texas! I was there Wed. 4/25 through Sun 4/29, sharing my loving, joy and Light!! At an orientation in Dallas April 24, our NFL hostess (Laura Lefton) informed us that there are over 1 million NFL season ticket members, and 32 of us were in this room! Definitely put everything in perspective! What a blessing and honor to have been selected to be here. Shortly thereafter, Laura was talking about how the NFL appreciates the fans: our commitment, love of the sport/teams, passion, etc. and said she’d like to show a video that represents all these qualities and more. She then asked: “Is that okay with you, Marianne?” SURPRISE again! If people can capture/get the “energy of loving and Light” from a video, my spiritual blessing was definitely passed along to all 32 teams represented that night, and they in turn took it back to their home cities. As for me, I continued to share my loving and JOY (a key aspect of my ministerial blessing) with everyone I met during my 5 day trip! Many of us bonded and have become BFFs (best friends forever). Spirit provides again! My ministry has now expanded beyond Philadelphia to all 32 cities with NFL football teams! The Eagles video announcing my selection for the draft has been distributed and shown to every NFL team, as well as the NFL staff in NYC! Here’s to their having received a huge dose of joy, loving and LIGHT through the video. While volunteering at this event, I connected personally one on one with a lot of the Philadelphia Eagles players (including: Carson Wentz, Zach Ertz, Super Bowl LII MVP Nick Foles, Nelson Agholor, Jake Elliott, Jason Kelce, Corey Clement, Brent Celek, Mack Hollins, Rodney McLeod, and Chris Maragos). In addition to acknowledging their individual “spirits”, I placed Light columns with each of them… for the highest good of all concerned. 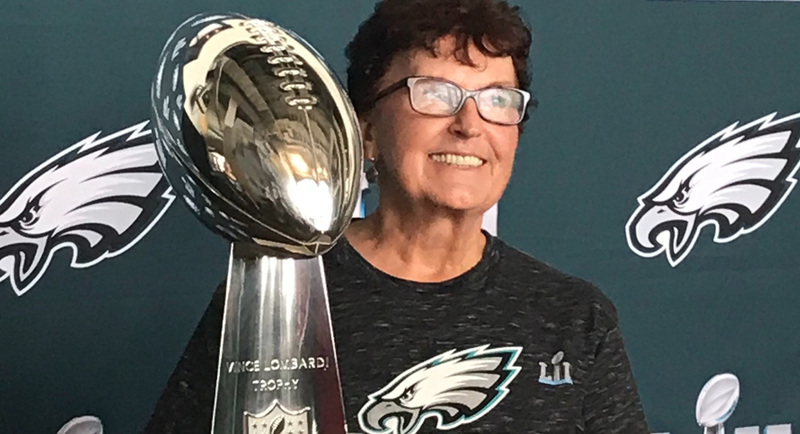 I had a second date with “Vince” — the Lombardi trophy, that is — on June 24, and placed more Light columns at Lincoln Financial Field in Philadelphia for the upcoming 2018 football season. Thanks for coming along for my spiritual and 10% level ride…. as I continue “living from the inside out.” A little voice inside keeps saying: “Spirit is up to something …there’s more to come.” And I don’t know what it is! So I intend to keep living from my heart, staying open to whatever next blessings come my way, and expressing my gratitude to Spirit for all the blessings in my life that already are. I hope you enjoyed my journey and “travels” vicariously and send LIGHT as they continue… for the blessings continue to abound! What fun and fulfillment for a fantastic Philly football fan! Wonderful fun story of the ministry. I lived in Philly in the 70’s and attended Eagles games. I got started in MSIA there. I feel an affinity for your work. Keep it up. Marianne! How fabulous. Your joy is contagious and your ministry a delight. Thank you Marianne for sharing your joyful ministry! The video moved me to tears. Much Light and love to your future ministry and whatever surprises Spirit has for you! Keep sharing! Watching NFL football has been a great pleasure for me. You inspire me to send Light.